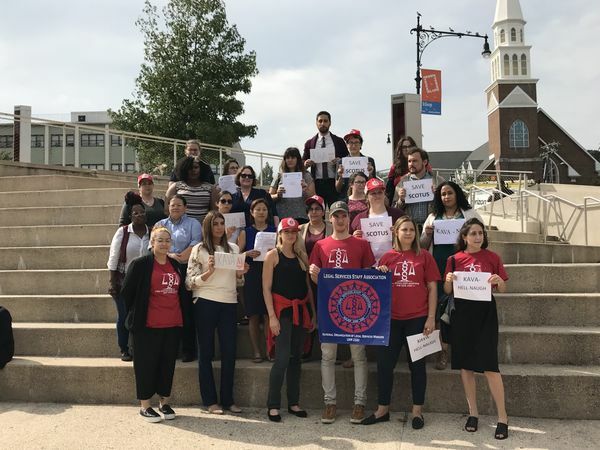 The Legal Services Staff Association (LSSA), NOLSW/UAW 2320, along with the Association of Legal Aid Attorneys (ALAA), UAW 2325, held simultaneous rallies in all five New York City boroughs on October 4, 2018, to protest the nomination of Brett Kavanaugh to the US Supreme Court. LSSA and ALAA members represent low-income New Yorkers in civil and criminal cases. Every day, we fight tooth and nail to protect our clients’ basic rights, and we see just how fragile those rights are. If he is appointed to the Supreme Court, Judge Kavanaugh will further erode the rights of women, people of color, and other oppressed groups. 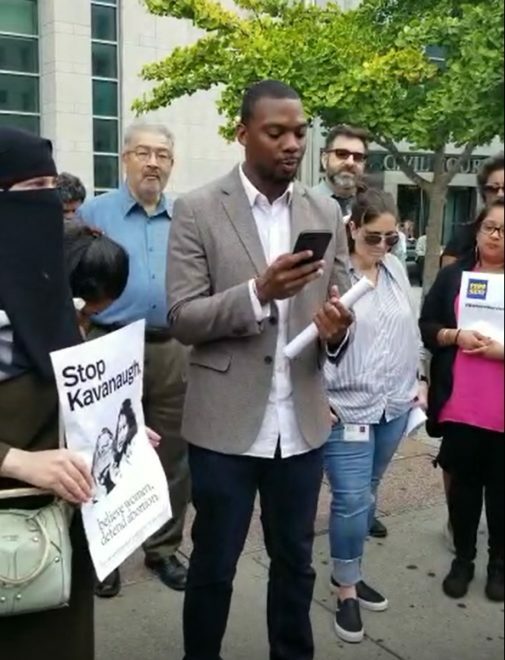 At 1pm on October 4th, LSSA and ALAA members converged at one location in each borough and held a one-hour rally in order to send a clear message that behavior like Kavanaugh’s is unacceptable, and that he should not be appointed to the US Supreme Court. Before last week, Brett Kavanaugh’s appointment to the highest court in the US seemed controversial but inevitable. Thanks to the incredible bravery of Dr. Christine Blasey Ford, this is no longer the case. Last Thursday, Dr. Ford stood before the US Senate and described her sexual assault at the hands of Judge Kavanaugh. Her testimony was heartfelt, moving, and obviously credible. Responding to that testimony, Judge Kavanaugh delivered a petulant, arrogant, and disrespectful speech filled with threats and lies. His temperament and partisanship demonstrate that he is not appropriate to sit on the Supreme Court. Meanwhile, others assaulted by Judge Kavanaugh continue to come forward. “People who are already vulnerable will face increased threat, and we could not, as people working within the legal system, stand idly by while his nomination and his appointment was rushed through,” said MFJ staff attorney and LSSA union member Brian Sullivan to WCBS Newsradio 880. Click here to listen to their report. As lawyers, paralegals, social workers, administrative staff and legal services workers, and as union members, survivors of sexual violence, women, and allies, we will not stand idly by while this man is handed incredible power over our lives and the lives of our clients. 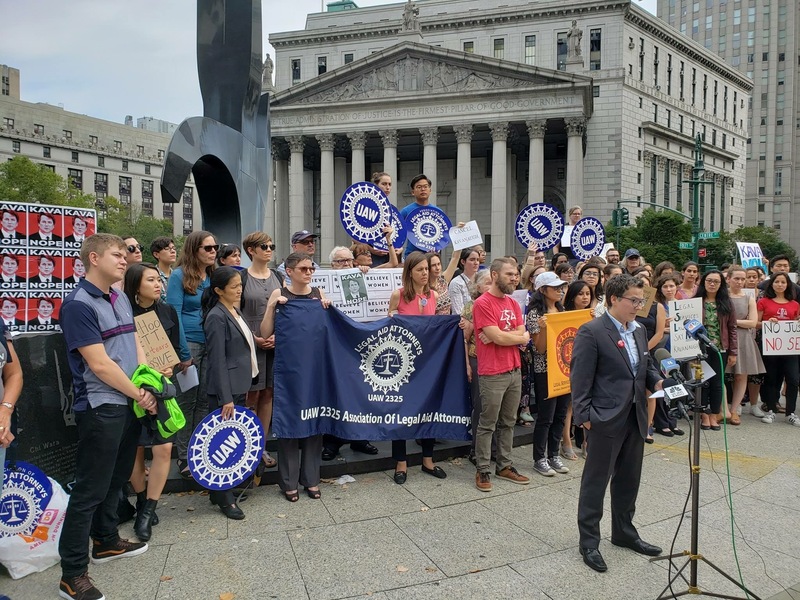 We thank all legal services workers and other New Yorkers who stood with us to oppose Brett Kavanaugh’s appointment to the nation’s highest Court. …a “wall-to-wall” union representing the secretaries, process servers, paralegals, receptionists, social workers, support staff, attorneys & other non-management employees of Legal Services NYC (LSNYC) and Mobilization for Justice (MFJ). Founded in 1973, LSSA is a unit of the National Organization of Legal Services Workers (NOLSW), UAW Local 2320.